I have read Paul Theroux’s The Old Patagonian Express: By Train Through the Americas several times. It got me interested in visiting South and Central America in the first place; and I keep tryi9ng to relive the experience of reading it the first time. Back in the 1970s, there was still passenger rail service in Guatemala. Now there are only railroad museums with rusting locomotives. The following is the author’s take on recent Guatemalan history—which is still largely true. 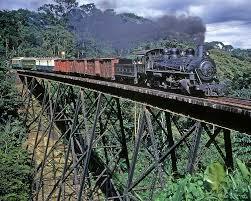 I had a political reverie on that train [the one between Tecun Uman and Guatemala City]. It was this: the government held elections, encouraged people to vote, and appeared to be democratic. The army appeared to be impartial, the newspapers disinterested. And it remained a peasant society, basically underfed and unfree. It must perplex any peasant to be told he is living in a free country, when the facts of life contradict this. It might be that this does not perplex him; he has every reason to believe, in accordance with the evidence, that democracy is feudal, a bureaucracy run by crooks and trigger-happy vigilantes. When one sees a government of the Guatemalan sort professing such high-mindedness in its social aims and producing such mediocre results, one cannot be surprised if the peasant concludes that communism might be an improvement. It was a Latin American sickness: inferior government gave democracy an evil name and left people with no option but to seek an alternative.